Hi all! 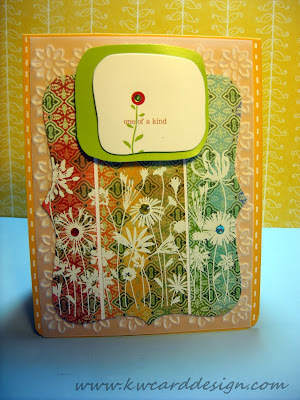 Back with you to share my entry for this week's CAS-ual Friday Challenge: Embossing. This time we needed to make a card that features any type of embossing - dry embossing, heat-set or embossing folders. I did two types for my card, heat - set and used an embossing folder. I heat embossed my Hero Arts image on a piece of patterned paper from the new stack from BG : Indie Bloom. I then added a bit of distress ink to the image to bring it out a bit on the paper and to tone down the "brightness" of the paper. I wanted COLOR in my project, and this paper was perfect for it. I, then cut the image up into three segments, and added them to a piece of white card stock from Gina K. Designs. I die cut the image then with my Top Note Die from SU! I took a piece of vellum card stock and one of my cuttlebug folders and embossed the vellum. I didn't want to take away the beautiful card base color of Summer Sunrise card stock from PTI, that is why I thought vellum would be a different choice. I then adhered all of it to my card base, and I had this cute card stock sticker, and added it for my sentiment. For the final steps, I added some gemstones color by some Copic markers, and some "faux" stitching on the sides with my white gel pen. Until next time!!! Keep smilin'! and creative! oh wow, this is absolutely stunning. I LOVE the white embossed flowers against that paper, I'm seriously drooling over here. Probably one of my favorites of yours :) I hope you win!! And the textured vellum looks awesome!